"Going, Going ... Caught! 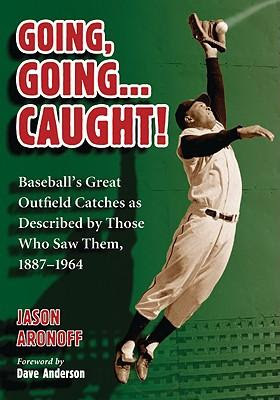 - Baseball's great outfield catches as described by those who saw them, 1887-1964"
On the heels of Dewayne Wise's leaping catch during Mark Buehrle's perfect game, it's only appropriate that I present a book detailing the greatest outfield catches in Major League Baseball's history. "Going, Going ... Caught!" was originally recommended to me by former Brooklyn Dodger outfielder Don Thompson as he attempted to describe Duke Snider's nearly impossible catch of Willie "Puddin Head" Jones' smash in Philadelphia on Memorial Day of 1954. Thompson should know a thing or two about Snider's climb up the wall that day; he was standing next to Snider when he did the seemingly impossible, digging his spikes into the outfield fence after sprinting into the depths of left-center only to throw his glove hand above his head and across his body for the catch as he collided with the wall. While Aronoff provides an illustration recreating the catch, there are no actual photographs of his theatrics available. This goes for about 95% of the other catches mentioned in the book. All we have left of these grabs are the accounts from the sportswriters and players who saw them. These accounts are what make this book special. You are transported back to a time when mass media didn't cover baseball and left you to create your own picture of a great center fielder chasing down a ball that seems way out of his reach. Aronoff has done painstaking research to uncover multiple sources detailing catches that the writers at the time described as the "best ever." There is great detail given to the dimensions of old ballparks and how their cavernous reaches allowed for these players to catch up to balls that everyone in the crowd thought were going to fall in for extra-base hits.. Unlike modern stadiums, outfielders had to travel farther distances and contend with unpadded wooden and concrete walls to haul in shots hit into the far reaches of the ballpark. While "Going, Going, Caught!" is well researched, the reader is bogged down with redundant accounts of the same catch, and multiple catches made by the same player that were "very good" but not great. Aronoff could have condensed the accounts he relayed in order to make it more digestible. It may be a bit too intense for the casual baseball reader, or those not familiar with the players of yesteryear. However, Aronoff's book not only further enlivens the debate between Mantle, Snider and Mays, it also brings up fielding stars that time has forgotten, such as Jimmy Piersall, Terry Moore, Jigger Statz, Dode Paskert, Bill Lange, and baseball's earliest deaf player, "Dummy" Hoy. It may even make you question your beliefs of who is the greatest outfielder of all time. While their Hall of Fame contemporaries of Keeler, Cobb, Speaker, and DiMaggio are all profiled at one point, it's the exploits of the lesser known aforementioned players that make "Going, Going ... Caught" run.